Scale down and focus: So don’t be the next Facebook, at least not immediately. Go back into your plan and find the core components that drive the rest. Narrow the market, narrow the business offering, and shorten the time from zero to revenue. Reduce the risk on the big questions of viability and market. Lower your valuation. Create smaller milestones for the short term. Partner up. The most common hurdle is the credibility of experience. Investors don’t want to fund anybody’s virgin startup. If you’ve never worked with a startup, then find a partner or two who have. They don’t insist that you’ve already launched and exited successfully, but they do insist that you’ve been through a startup. Maybe you weren’t the founder, but you were there early and stayed long enough to get the idea. And experience with startup failure is way better than no startup experience. There is a catch-22 problem in startup funding: you can’t get experience if you can’t get funded, but you can’t get funded if you don’t have experience. Deal with it. Sell Something. Nothing validates a new business like actual sales. Checks written and signed say way more than big market numbers. If you don’t have the product to sell yet, cook up a deal for pre-sales. Offer huge discounts. Put it on kickstarter if you can. Find somebody to write you a written promise of sales and contracts as soon as you’re ready. Bootstrap it. Re-read my #1 above, on scaling down and focusing. Many a food cart ended up as a fancy restaurant. Start with the part of it most likely to fund itself. Watch your costs. Keep your day jobs a while longer. Prove it to yourself and the rest of the world by starting a subset and making it work. Attitude adjustment: Consider my illustration above. 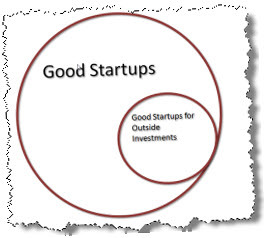 There are more good startups than good investors. Lots of good businesses aren’t good investments. They might not need investment to grow, might not have obvious exits, and — quite common — offer great ROI for founders but not for investors. Get a clue: Yes, this point directly contradicts #5. Paradox is part of business. While some good businesses aren’t good investments, it’s also true, and probably more often, that if nobody wants a piece of your great new startup then it isn’t all that great. Reconsider. Maybe it’s time to walk away. Don’t blame the investors: There’s a lot of wasted emotion on this point, not to mention conspiracy theories, class warfare, whining, and what-not. Investors aren’t good or bad, they are just looking for a good return on their money. They write checks. They get to make choices. If you keep getting rejected, change something. Fix what’s wrong with your deal or just do it yourself. If you give somebody value, for something they need or want enough to pay money for it, then there’s a business there. Eventually. And if you aren’t giving value and people won’t pay for it, then keep your day job. Love this post. Failing to get funded shouldn’t necessarily be the end, but it should be a wake-up call. And in many cases, it probably means you’re on the right track. Failing to get funded should be empowering.